OGUNQUIT, ME. — A funny thing about summer theater: As the weather gets hotter, the fare tends to get a little lighter. Nothing wrong with that. Who wants to get weighted down with the problems of the world when you can mull the probability of a woman playing a man playing a woman in a Parisian nightclub in 1934 while catching the attention of a Chicago gangster? 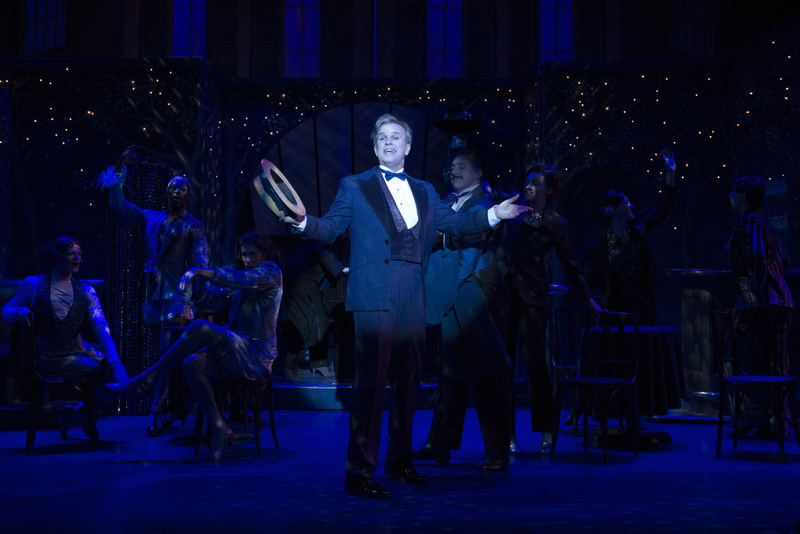 So sit back and relax and enjoy the Ogunquit Playhouse production of the musical “Victor/Victoria,” based on the popular 1983 Blake Edwards movie that starred Julie Andrews and Robert Preston. “Victor/Victoria” was only a modest success on Broadway. Andrews was famously unhappy with Tony voters when she was the show’s lone Tony nomination in 1995 and declined her nomination, preferring to stand with her husband Blake Edwards, who wrote the book and directed on Broadway and was snubbed by Tony voters. Andrews, of course, famously developed vocal problems during the run that forced her to leave the show, and after a subsequent operation on her vocal cords went awry, would never sing professionally again. Composer Henry Mancini died before the project was completed and Frank Wildhorn came in to complete the score, also contributing to the lyrics by Leslie Bricusse. With so many fingers in the pie, the piece can seem disjointed at times, but here there are two old Broadway pros with a lot still left in the tank who make things right. George Dvorsky, who boasts a boatful of fine performances at North Shore Music Theatre in Beverly over the years, has morphed seamlessly through the years from a young leading man to a mature leading man/character actor, and here he is Carroll Todd — “Toddy” — the gay cabaret singer in Paris who befriends Englishwoman Victoria Grant (Lisa Brescia), an opera singer who is in dire straits after a tour with a musical group is derailed by stolen funds. Toddy devises a scheme in which Victoria will be transformed into Victor, a Polish nobleman who is the world’s greatest female impersonator — a woman playing a man playing a woman. Toddy convinces the well-known Henri Cassell (Bob Marcus) to present Victor, but he/she must evade the suspicions of café owner Henri Labisse (Joe Joyce), Toddy’s former employer, whose attempts to unmask the deception end up in hilarious Wile E. Coyote fashion disaster. The vocal demands of Victoria are considerable — remember the piece was written for Andrews and her remarkable range — and Brescia does herself proud. Dvorsky is a solid singer, dancer and actor, and he makes it look easy, even managing to look damn fine in a dress in the finale. The production has some added glitz because of the use of the sumptuous Broadway costumes and sets, including Robin Wagner’s ingeniously-designed set that includes the upstairs and downstairs levels of two adjoining hotel suites, which allows for some hilarious hanky-panky between the suites. 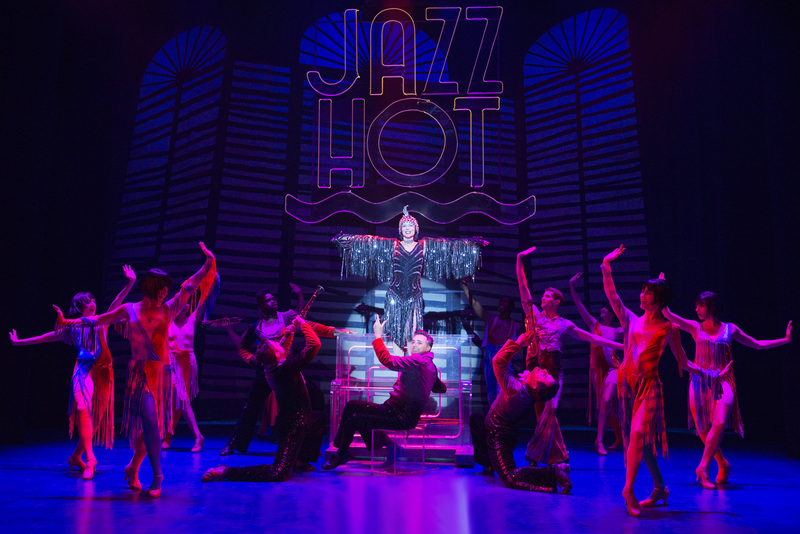 Willa Kim’s costumes make numbers such as “Louis Says” and “Le Jazz Hot” even more spectacular. Darren Ritchie is a stolid leading-man type as the Chicago gangster King Marchand — he has the best voice of any one of several actors I’ve seen play the role — who is smitten by Victor, calling into question his own sexuality if Victor is indeed a male as he claims. The score is pleasurable, if not always memorable. “Paris By Night,” “Almost a Love Song,” and “Living in the Shadows” are all fine, but the best of the production numbers is the finale and title tune. Maine native Robyn Hurder has been handed the gift of playing the oversexed but underbrained chorus girlfriend of King’s, Norma Cassidy — the part that helped propel Rachel York to stardom, winning a Drama Desk Award on Broadway, a part that is a license to steal scenes — and she takes full advantage of it. Whether she‘s tangoing with Victor or crooning “Paris Makes Me Horny,” she’s instant laughter throughout. As Squash, aka Mr. Bernstein, Marchand’s bodyguard who is keeping a secret of his own close to the vest, Jacob Smith has a lot of fun and shows off a fine singing voice. The setting in various cabarets and bistros allow choreographer Darren Lee to stretch the legs of his good-looking, high-stepping ensemble. Director Matt Lenz makes sure the cast mines every laugh there is to be had in the book by Edwards, with its gender-bending plot and themes considered somewhat daring decades ago, as opposed to recent ground-breaking events. “Victor/Victoria” is a musical with a big heart that provides strong value for your entertainment dollar. And it’s a first-class musical escape that won’t tax your brain while it’s on vacation in beautiful Ogunquit.